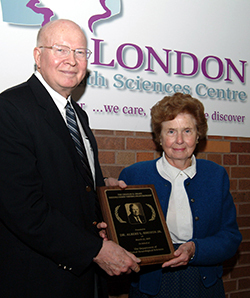 The Charles G. Drake Professorship Lecture is named for London’s first and one of the world’s foremost neurosurgeons. Dr. Drake was trained by Canada’s first neurosurgeon, Dr. Kenneth McKenzie of Toronto. In the early 1950's there were very few direct operations being done for ruptured brain aneurysms. However, Dr. McKenzie thought there might be a future in it and suggested that Charlie Drake should have a “crack” at it. The person and the opportunity had met. Dr. Drake carefully developed and perfected methods for tackling aneurysms in various locations under the brain. 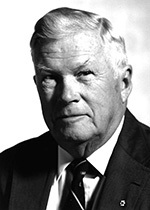 He and his radiologist partner Dr. John Allcock were among the first to recognize the condition of delayed cerebral vasospasm after aneurysm bleeding. With his anesthesiologist partner Dr. Ron Aitken (see Aitken Memorial Lecture), he evaluated profound hypotension and hypothermia to protect the brain during surgery. He invented new devices including the fenestrated clip to better treat unusually complex aneurysms. Most importantly, Dr. Drake looked critically at the results of his work, recording observations on track sheets, and asking himself why things sometimes went wrong during surgery, and how it might have been done better. Dr. Drake had an engaging manner, and had the knack of bringing out the best in the people around him. It was London’s good fortune that he persuaded Dr. Henry Barnett to come from Toronto in 1969 to form a combined department of neurological physicians and surgeons, along with pathologists, radiologists and others dedicated to the study and treatment of neurological diseases. To a large degree, his legacy is the influence he exerted through his students, who are now leaders in their fields throughout Canada and around the world. "An Unplanned and Unfinished Journey Through Objectives, Cultures, and Diversity"
Watch Dr. Vinuela's Lecture here. "AVM Review and Perspective on Treatment Options"
2009 - Dr. Robert D. Brown Jr.
"Unruptured Aneurysms: Resolving the Uncertainty"
"The Art & Beauty of the Brain"
2018 Charles G. Drake Symposium. Dr. Fernando Vinuela, Dr. Allan Fox, and Dr. David Pelz. 2005 Charles G. Drake Symposium. Mrs. Drake presents Dr. Rhoton with his plaque.